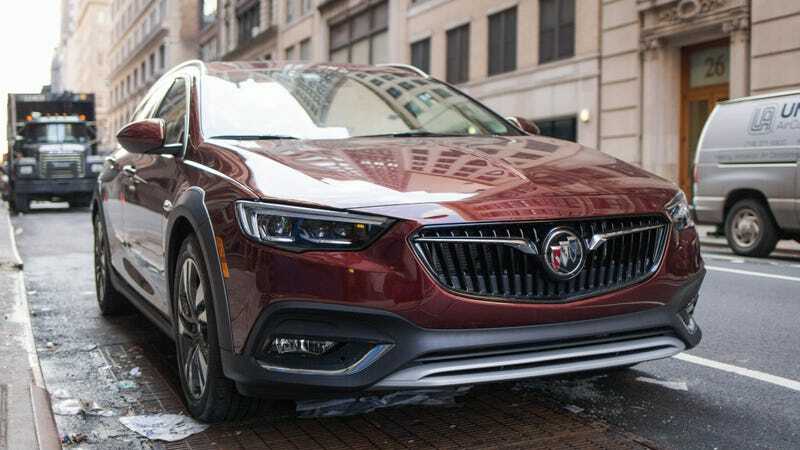 What Do You Want To Know About The 2018 Buick Regal TourX? There aren’t terribly many wagons on the current market to choose from, but thankfully, there’s this one from Buick: The 2018 Regal TourX. What do you want to know about it? I’m already in love with the deep metallic red that this press car arrived with. The Torks wagon comes standard with all-wheel drive, an eight-speed automatic and a 2.0-liter four-cylinder engine, good for 250 horsepower. I haven’t driven it much yet—only to and from the office—but I can report that the car feels good, despite it being quite long and challenging to place. The suspension is nice and firm over the trash city roads, the steering actually has some weight to it and the brakes grab smoothly. The interior controls are well lit, clearly defined and there are buttons and knobs. Thrilling! Unfortunately, I don’t suspect that the seats will be very comfortable over a long trip, as they are rather stiff, but I’m going to test that out in a few days to be sure. It is a very handsome wagon. If you covered up the badges, you wouldn’t know that you were looking at a Buick. I think that’s really this car’s biggest hurdle: Brand snobbery. That, and all the black plastic trim along the bumpers and the wheel wells. That stuff never ages healthily. The Torks’ standard price is $35,020, but this one is optioned out to $41,715.